Glowing Bear: the new tranSMART UI is almost here! Home > The Hyve Blog > Glowing Bear: the new tranSMART UI is almost here! Update: Glowing Bear is now publicly available! Read the blog post here. tranSMART is a data warehouse which enables sharing, storing and analyzing various types of biomedical data. It was originally developed by Janssen R&D in 2009 and has been a prominent member of the data warehousing arena every since. It has been actively adopted in pharmaceutical companies, universities and academic hospitals all over the world. However, over the past few years the tranSMART community has received numerous requests from researchers and scientists to implement extra functionality. The requests included features such as supporting longitudinal data, and being able to save and re-execute queries. In 2016-2017 The Hyve worked on the development of these new functionalities in the 17.1 project sponsored by Pfizer, Sanofi, Abbvie and Roche and developed a new tranSMART 17.1 backend. However, the project did not include the refactoring of tranSMART user interface, which was necessary to support the new functionalities. The Hyve therefore started a parallel project, the goal of which was to develop a new, modern user interface for tranSMART which would support the new functionalities, under the name “Glowing Bear”. In Glowing Bear, tranSMART combines a completely revamped, modern and intuitive interface with improved performance. Our team paid a lot of attention to performance in this project and, together with upgrading the framework to Angular 4, made adjustments in the query structure to make better use of the new backend. possibility of saving your queries and re-executing them later to capture newly added data. It enables you to ask tranSMART questions that could not be asked before, such as “How many patients had treatment A in the year 2016?”. 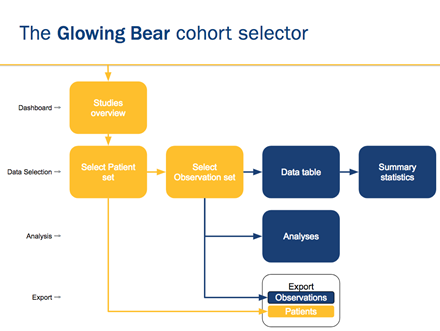 Glowing Bear is often referred to as cohort builder / cohort selector, as it is specialized in defining patient and sample cohorts. Glowing Bear was developed as a stand alone tool. This implies that it is not limited to querying just tranSMART. In principle, Glowing Bear can be connected to any database backend via the API (as long as the data model of the database is compatible with the data model of Glowing Bear) and used to query the data in that database. This makes Glowing Bear a tool to query, e.g., i2b2 data and run on top of the i2b2 backend, which opens even more doors for Glowing Bear. To summarize, Glowing Bear is a new, modern interface on top of tranSMART (that can also be run stand alone), and it enables you to leverage new tranSMART 17.1 functionality and build cohorts you were not able to build before. What’s next in Glowing Bear development? at the beginning of 2018! Stay tuned for more updates on Glowing bear, or if you want to see how we use Glowing Bear on top of i2b2 (coming soon! ).